A modern and spacious semi detached house offering family size accommodation including a large lounge, kitchen diner, rear conservatory, three bedrooms and en suite facility. Constructed in 2003 by a reputable builder, the house is ready to move into and has no forward chain. With a pleasant open aspect at the front, the property is situated on the outskirts of Towyn, close to the popular seaside towns of Abergele and Rhyl. Schools for all age groups are nearby and the A55 Expressway can be accessed at Abergele, providing an easy commute along the North Wales coastline, Chester and beyond.This lovely home won’t disappoint and will appeal to those seeking a contemporary and generously proportioned residence. ENTRANCE HALL With a coved ceiling, oak block flooring, storage cupboard, radiator and wall lights. 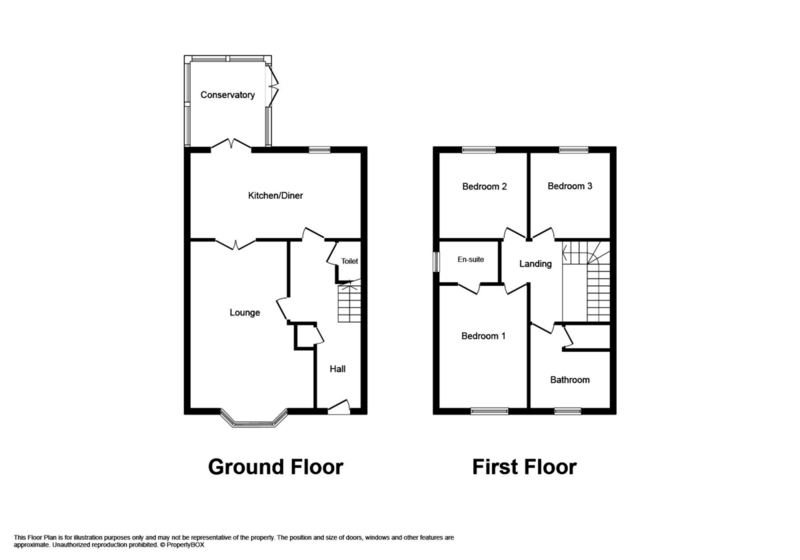 CLOAKROOM 5′ 5" x 2′ 6" (1.66m x 0.78m) Under stairs cloakroom with a low flush wc, corner pedestal wash hand basin, extractor fan and tiled flooring. CONSERVATORY 9′ 11" x 9′ 0" (3.03m x 2.76m) Constructed in uPVC with double glazing throughout. Radiator, power points, TV aerial point and French doors leading out into the rear garden. LANDING Turned staircase with timber balustrade leads to landing with loft hatch and smoke alarm. BEDROOM ONE 11′ 7" x 10′ 10" (3.55m x 3.31m) Master bedroom with uPVC double glazed window overlooking the front of the property, radiator and power points. EN SUITE 4′ 6" x 2′ 11" (1.39m x 0.90m) Fitted with a three piece suite comprising low flush wc, pedestal wash hand basin within a vanity unit and a fully tiled cubicle enclosing a Vista electric shower. Frosted uPVC double glazed window, extractor fan and ceiling spotlights. BEDROOM TWO 10′ 2" x 9′ 6" (3.11m x 2.90m) Another double sized room with power points, radiator and uPVC double glazed window overlooking the rear garden. BATHROOM 8′ 0" x 6′ 7" (2.46m x 2.02m) With white modern three piece suite comprising panelled bath with mixer tap, contemporary glass bowl sink with mixer tap over, fitted shelf above and low flush wc. Storage cupboard, Chrome ladder style towel/radiator and part tiled walls. Spotlights in the ceiling and extractor fan. Frosted uPVC double glazed window. OUTSIDE Lawned front garden and driveway providing ample parking and leading to double timber gates. Side area with timber storage shed and opening into the rear garden, all bounded by concrete post and timber fencing. Mainly laid to lawn with flagged patio area and gravelled corner piece. DIRECTIONS From the agent’s office, turn left at the second set of traffic lights and follow the road into Pensarn. Continue along the coast road into Towyn and, at the traffic lights, turn right into Gors Road. Proceed along, round the bend and take the turning on the left into Ffordd Y Berllan. Follow the road into the estate and Llys Emlyn will be seen at the bottom on the left. Number 5 is on the left, identified by our for sale board. SERVICES Mains electric, gas, water and drainage are believed available or connected to the property. All services and appliances not tested by the selling agent.